Wasp.io automatically tracks errors generated by your applications, intelligently notifies your team, and provides realtime data feeds of errors and activity for all of your websites. Get realtime error reporting about all of your projects whether you're at the desk or on the move between clients. We'll give you as many or as few notifications about your projects' errors. Just adjust the message types in your user settings menu and we'll buzz you only when you want us to. Track all of your projects in the same place, at no extra cost. That’s right. What developer or PM doesn’t have way too much at the same time? Because your team matters, you can get them all involved in your projects at no extra cost. One account, unlimited users. Errors are grouped by the root cause rather than line and file, which means that hitting the enter key isn’t going to create a different error for you to be worried about. Wasp allows you to manage notifications for individual projects, and the error levels you care about. You’re only notified as an error increases in frequency, which means you don’t get 1,000 notifications if an error occurs 1,000 times. The entire path by which an error occurred, along with all of the parameters along the way. No more wondering what data was passed to the function you slaved over for weeks. Create and send your own data, with or without an error. Wrote a function that you hope never gets used? There’s a function for that! Wasp will notify you in realtime of errors, exceptions, and commits for all of your projects right in your browser so you never miss a critical problem. All of our integrations are designed to make your life easier- and that means no weird complicated installations. Most languages can be integrated and sending data to Wasp in five minutes or less. One project using multiple programming languages? No problem. 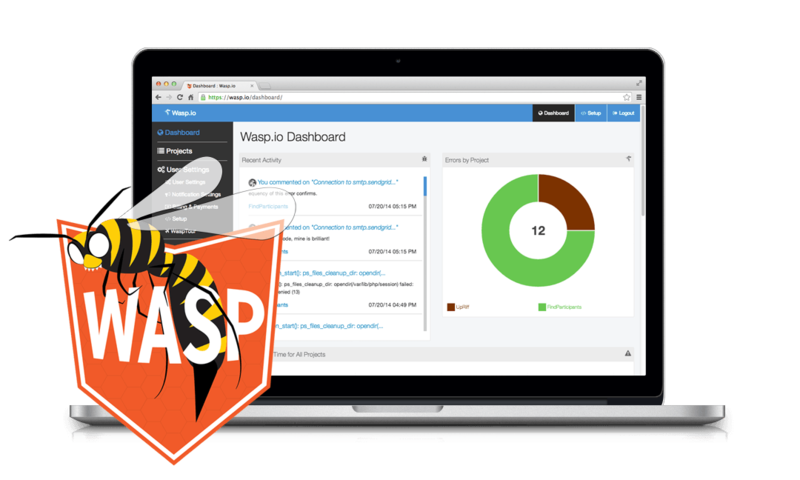 Wasp is language agnostic, and allows you to manage everything from your account. Concerned about why someone on your team just muted a core error? 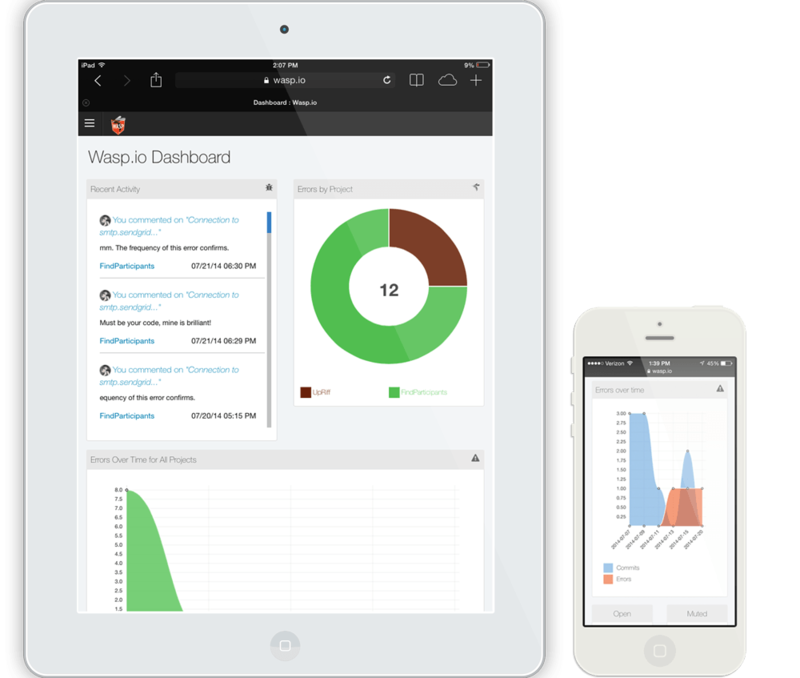 That’s between you and them, but actions in Wasp are tracked to keep your whole team updated (even if it leaves you wondering who hired that guy!). Integrate GitHub into all of your projects to see trends in commits vs. error frequency, real-time commits, detailed commit logs, and more! Love Wasp but want to send data to your own thing? Good. Integrate Wasp into your own apps using any outbound webhook you want. Not sure you need all that much (or just don't want to pay for another service)? We have a free plan for that. The Free plan is limited to 1 project, 1 user, 5 errors per minute, a storage duration of 7 days, and 1,000 records. After you've signed up, you can cancel, downgrade, or upgrade your account at any time. If you cancel your account, your billing will cease immediately and at the end of your last subscription your account will automatically switch to a free account. We do not issue refunds for partial or prior billings. Indeed there is! The Free plan is limited to 1 project, 1 user, 5 errors per minute, a storage duration of 7 days, and 1,000 records. Easy. Sign up for an account, and when your trial period expires, do nothing ;) We automatically switch users without a subscription, or with an expired subscription to the free plan. What if I Exceed My Api Requests? Our API just dismisses overflow requests with a 418 status, however, our integrations are designed to make sure this won't break your application, or generate any errors.